Crecia-Kasuga Co.'s new No. 2 tissue paper machine will be installed next to the No. 1 machine (pictured above) at the Fuji Mill in Shizuoka, Japan. 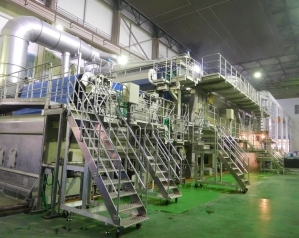 March 26, 2019 - Nippon Paper Industries announced that it will invest about 8 billion yen to install a second tissue machine at its Fuji Mill in Shizuoka, Japan — Crecia-Kasuga Co., Ltd. The new machine, No. 2 paper machine, will produce toilet tissue and have a production capacity of 40,000 tons per year. Crecia-Kasuga Co. is a joint venture established by Nippon Paper Crecia Co., Ltd. and Kasuga Paper Industry Co., Ltd. The No. 2 machine will be installed next to the No.1 paper machine, which started production in May of 2018 and has an annual capcity to produce 36,000 tons of tissue. Nippon Paper expects start-up of the new machine in June 2020. Nippon Paper Industries produces coated and uncoated paper, specialty paper, paperboard and tissue. To learn more about Nippon Paper Industries, please visit: www.nipponpapergroup.com. SOURCE: Nippon Paper Industries Co., Ltd.